Located in the heart of Spain. Madrid is the European Union's third largest city after London and Berlin. It is Spain's capital, and the home of the Spanish Monarchy. 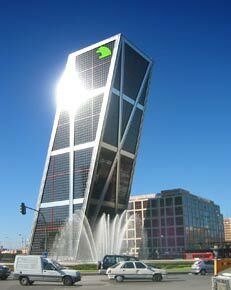 Madrid is also the nation's financial and administrative centre. Madrid-Barajas is the country's busiest airport. The city's transportation links offer convenient domestic and international travel options. This cosmopolitan city draws its charm from its modern architecture and its unique old town appeal. Madrid features a large number of museums (such as the famous Prado Museum, the Thyssen-Bornemisza Museum, the Reina Sofí­a Museum, etc) and art galleries, which house some of Spain's finest painters. Goya, Picasso, Dali and Velazquez are among some of the artists displayed in the capital. The Buen Retiro, Madrid's most famous park offers an excellent backdrop for picnics, romantic strolls or mid-afternon naps in the sunshine. With a city as vibrant as Madrid, the nightlife is just as exciting. There are countless pubs and bars to cater to everyone. As the capital of the country, Madrid is also the shopping capital of Spain! The city offers more than 54,000 shops for all of your retail needs. Tourists are encouraged to visit the famous El Escorial monastery, a must-see for anyone interested in history, this is where the majority of Spain's kings are buried. 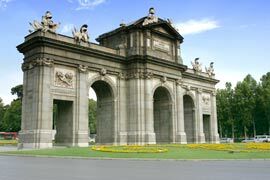 As Madrid is centrally located and well connected to the rest of Spain, it is a convenient city from which to travel to other Spanish destinations. You can reach a number of cities in just about an hour: Toledo, Avila, Aranjuez and Segovia. Madrid is also the central connection point for many other transport links, meaning you can get to any part of Spain from here, be it by bus, train or plane. The city of Madrid is situated in the very centre of the country and has more than 3.5 million inhabitants. 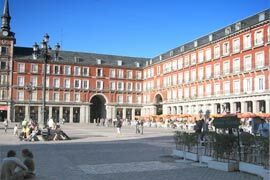 As the cosmopolitan capital city of Spain, Madrid is not only the business centre, headquarters of the administrative bodies and Government of Spain, but also the home of Spanish Monarchy. Most of Madrid's industrial activity is centred on the city's southern edge, where important food, metal and textile factories are found. Madrid is known not only for its rich culture and vibrant arts scene, but also for its lively nightlife. Madrid enjoys the best aspects of a capital city: its huge green spaces, such as the Retiro Park, its top-of-the-range shopping opportunities as well as Spain's most famous monuments, mean there's always something to see. Madrid also hosts its own fashion week, which propels Spanish fashion into the world spotlight.Students and business people alike enjoy Madrid's unique character, where the nightlife is notably animated, and parties and clubs carry on till sunrise. Madrid is truly worth a visit. While the site of modern-day Madrid has been occupied since pre-historic times, the history of the city dates back to the reign of Arab Emir Mohamed I (852-886), who had a fortress constructed on the Manzanares River. The city was fought over by the Arabs and Christians until Alonso VI conquered it in the 11th Century. In June 1561, King Phillip the Second moved his court to Madrid, cementing its place as the political centre of the monarchy, and thus the capital of Spain. Later, a wall was erected to protect the new outlying areas, and in the 18th century, some of the city's greatest "arteries" were implemented, including El Paseo las Acacias and El Paseo del Prado. While remnants of the city's heritage are still visible in neoclassical and Baroque structures which include the Plaza Mayor and Spain's Royal Palace, Madrid experienced a boom in the 1950s, where newer structures expanded the city, such as Paseo de la Castellana and the surrounding financial buildings. San Isidro, Madrid's Patron Saint, is honoured with a truly Spanish fiesta in late May. This is a truly Madrileño celebration, where dancing and fairs take place in the fields of San Isidro. A calendar of cultural celebrations, such as music concerts and ballet, and the famous bullfights of Las Ventas are all part of the festival.